Liczba stron: 271 Jest to ujednolicona liczba stron, która ułatwi Ci porównanie długości książek. Każda strona Legimi to 200 słów. 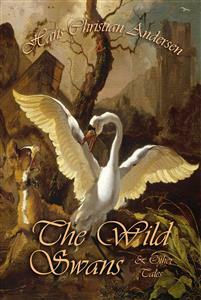 The Wild Swans is one of the eighteen stories featured in this timeless collection of fairy tales by Hans Christian Andersen. The story tells of a faraway kingdom where lives a widowed King with his twelve children: eleven princes and one princess. One day, he decides to remarry. He marries a wicked queen who was a witch. Out of spite, the queen turns her eleven stepsons into swans and forces them to fly away. The queen then tries to bewitch their 15-year old sister Elisa. Books 4 Libraries, and Audiobooks 4 All. All Rights Reserved. Without limiting the rights under copyright reserved above no part of this publication may be reproduced, stored in or introduced into a retrieval system or transmitted, in any form or by any means (electronic, mechanical, photocopying, recording or otherwise), without the prior written permission of both the copyright owner and the above publisher of this book. The greatest care has been taken in compiling this book. However, no responsibility can be accepted by the publishers or compilers for the accuracy of the information presented. Library of Congress Cataloguing in Publication Data. A catalogue record for this book has been requested. Far away in the land to which the swallows fly when it is winter, dwelt a king who had eleven sons, and one daughter, named Eliza. The eleven brothers were princes, and each went to school with a star on his breast, and a sword by his side. They wrote with diamond pencils on gold slates, and learnt their lessons so quickly and read so easily that every one might know they were princes. Their sister Eliza sat on a little stool of plate-glass, and had a book full of pictures, which had cost as much as half a kingdom. Oh, these children were indeed happy, but it was not to remain so always. Their father, who was king of the country, married a very wicked queen, who did not love the poor children at all. They knew this from the very first day after the wedding. In the palace there were great festivities, and the children played at receiving company; but instead of having, as usual, all the cakes and apples that were left, she gave them some sand in a tea-cup, and told them to pretend it was cake. The week after, she sent little Eliza into the country to a peasant and his wife, and then she told the king so many untrue things about the young princes, that he gave himself no more trouble respecting them. “Go out into the world and get your own living,” said the queen. “Fly like great birds, who have no voice.” But she could not make them ugly as she wished, for they were turned into eleven beautiful wild swans. Then, with a strange cry, they flew through the windows of the palace, over the park, to the forest beyond. It was early morning when they passed the peasant’s cottage, where their sister Eliza lay asleep in her room. They hovered over the roof, twisted their long necks and flapped their wings, but no one heard them or saw them, so they were at last obliged to fly away, high up in the clouds; and over the wide world they flew till they came to a thick, dark wood, which stretched far away to the seashore. Poor little Eliza was alone in her room playing with a green leaf, for she had no other playthings, and she pierced a hole through the leaf, and looked through it at the sun, and it was as if she saw her brothers’ clear eyes, and when the warm sun shone on her cheeks, she thought of all the kisses they had given her. One day passed just like another; sometimes the winds rustled through the leaves of the rose-bush, and would whisper to the roses, “Who can be more beautiful than you!” But the roses would shake their heads, and say, “Eliza is.” And when the old woman sat at the cottage door on Sunday, and read her hymn-book, the wind would flutter the leaves, and say to the book, “Who can be more pious than you?” and then the hymn-book would answer “Eliza.” And the roses and the hymn-book told the real truth. At fifteen she returned home, but when the queen saw how beautiful she was, she became full of spite and hatred towards her. Willingly would she have turned her into a swan, like her brothers, but she did not dare to do so yet, because the king wished to see his daughter. Early one morning the queen went into the bath-room; it was built of marble, and had soft cushions, trimmed with the most beautiful tapestry. She took three toads with her, and kissed them, and said to one, “When Eliza comes to the bath, seat yourself upon her head, that she may become as stupid as you are.” Then she said to another, “Place yourself on her forehead, that she may become as ugly as you are, and that her father may not know her.” “Rest on her heart,” she whispered to the third, “then she will have evil inclinations, and suffer in consequence.” So she put the toads into the clear water, and they turned green immediately. She next called Eliza, and helped her to undress and get into the bath. As Eliza dipped her head under the water, one of the toads sat on her hair, a second on her forehead, and a third on her breast, but she did not seem to notice them, and when she rose out of the water, there were three red poppies floating upon it. Had not the creatures been venomous or been kissed by the witch, they would have been changed into red roses. At all events they became flowers, because they had rested on Eliza’s head, and on her heart. She was too good and too innocent for witchcraft to have any power over her. When the wicked queen saw this, she rubbed her face with walnut-juice, so that she was quite brown; then she tangled her beautiful hair and smeared it with disgusting ointment, till it was quite impossible to recognize the beautiful Eliza. When her father saw her, he was much shocked, and declared she was not his daughter. No one but the watch-dog and the swallows knew her; and they were only poor animals, and could say nothing. Then poor Eliza wept, and thought of her eleven brothers, who were all away. Sorrowfully, she stole away from the palace, and walked, the whole day, over fields and moors, till she came to the great forest. She knew not in what direction to go; but she was so unhappy, and longed so for her brothers, who had been, like herself, driven out into the world, that she was determined to seek them. She had been but a short time in the wood when night came on, and she quite lost the path; so she laid herself down on the soft moss, offered up her evening prayer, and leaned her head against the stump of a tree. All nature was still, and the soft, mild air fanned her forehead. The light of hundreds of glow-worms shone amidst the grass and the moss, like green fire; and if she touched a twig with her hand, ever so lightly, the brilliant insects fell down around her, like shooting-stars. All night long she dreamt of her brothers. She and they were children again, playing together. She saw them writing with their diamond pencils on golden slates, while she looked at the beautiful picture-book which had cost half a kingdom. They were not writing lines and letters, as they used to do; but descriptions of the noble deeds they had performed, and of all they had discovered and seen. In the picture-book, too, everything was living. The birds sang, and the people came out of the book, and spoke to Eliza and her brothers; but, as the leaves turned over, they darted back again to their places, that all might be in order. When she awoke, the sun was high in the heavens; yet she could not see him, for the lofty trees spread their branches thickly over her head; but his beams were glancing through the leaves here and there, like a golden mist. There was a sweet fragrance from the fresh green verdure, and the birds almost perched upon her shoulders. She heard water rippling from a number of springs, all flowing in a lake with golden sands. Bushes grew thickly round the lake, and at one spot an opening had been made by a deer, through which Eliza went down to the water. The lake was so clear that, had not the wind rustled the branches of the trees and the bushes, so that they moved, they would have appeared as if painted in the depths of the lake; for every leaf was reflected in the water, whether it stood in the shade or the sunshine. As soon as Eliza saw her own face, she was quite terrified at finding it so brown and ugly; but when she wetted her little hand, and rubbed her eyes and forehead, the white skin gleamed forth once more; and, after she had undressed, and dipped herself in the fresh water, a more beautiful king’s daughter could not be found in the wide world. As soon as she had dressed herself again, and braided her long hair, she went to the bubbling spring, and drank some water out of the hollow of her hand. Then she wandered far into the forest, not knowing whither she went. She thought of her brothers, and felt sure that God would not forsake her. It is God who makes the wild apples grow in the wood, to satisfy the hungry, and He now led her to one of these trees, which was so loaded with fruit, that the boughs bent beneath the weight. Here she held her noonday repast, placed props under the boughs, and then went into the gloomiest depths of the forest. It was so still that she could hear the sound of her own footsteps, as well as the rustling of every withered leaf which she crushed under her feet. Not a bird was to be seen, not a sunbeam could penetrate through the large, dark boughs of the trees. Their lofty trunks stood so close together, that, when she looked before her, it seemed as if she were enclosed within trellis-work. Such solitude she had never known before. The night was very dark. Not a single glow-worm glittered in the moss. Sorrowfully she laid herself down to sleep; and, after a while, it seemed to her as if the branches of the trees parted over her head, and that the mild eyes of angels looked down upon her from heaven. When she awoke in the morning, she knew not whether she had dreamt this, or if it had really been so. Then she continued her wandering; but she had not gone many steps forward, when she met an old woman with berries in her basket, and she gave her a few to eat. Then Eliza asked her if she had not seen eleven princes riding through the forest. “Yes, take me with you,” said Eliza. Then they spent the whole night in weaving a net with the pliant willow and rushes. It was very large and strong. Eliza laid herself down on the net, and when the sun rose, and her brothers again became wild swans, they took up the net with their beaks, and flew up to the clouds with their dear sister, who still slept. The sunbeams fell on her face, therefore one of the swans soared over her head, so that his broad wings might shade her. They were far from the land when Eliza woke. She thought she must still be dreaming, it seemed so strange to her to feel herself being carried so high in the air over the sea. By her side lay a branch full of beautiful ripe berries, and a bundle of sweet roots; the youngest of her brothers had gathered them for her, and placed them by her side. She smiled her thanks to him; she knew it was the same who had hovered over her to shade her with his wings. They were now so high, that a large ship beneath them looked like a white sea-gull skimming the waves. A great cloud floating behind them appeared like a vast mountain, and upon it Eliza saw her own shadow and those of the eleven swans, looking gigantic in size. Altogether it formed a more beautiful picture than she had ever seen; but as the sun rose higher, and the clouds were left behind, the shadowy picture vanished away. Onward the whole day they flew through the air like a winged arrow, yet more slowly than usual, for they had their sister to carry. The weather seemed inclined to be stormy, and Eliza watched the sinking sun with great anxiety, for the little rock in the ocean was not yet in sight. It appeared to her as if the swans were making great efforts with their wings. Alas! she was the cause of their not advancing more quickly. When the sun set, they would change to men, fall into the sea and be drowned. Then she offered a prayer from her inmost heart, but still no appearance of the rock. Dark clouds came nearer, the gusts of wind told of a coming storm, while from a thick, heavy mass of clouds the lightning burst forth flash after flash. The sun had reached the edge of the sea, when the swans darted down so swiftly, that Eliza’s head trembled; she believed they were falling, but they again soared onward. Presently she caught sight of the rock just below them, and by this time the sun was half hidden by the waves. The rock did not appear larger than a seal’s head thrust out of the water. They sunk so rapidly, that at the moment their feet touched the rock, it shone only like a star, and at last disappeared like the last spark in a piece of burnt paper. Then she saw her brothers standing closely round her with their arms linked together. There was but just room enough for them, and not the smallest space to spare. The sea dashed against the rock, and covered them with spray. The heavens were lighted up with continual flashes, and peal after peal of thunder rolled. But the sister and brothers sat holding each other’s hands, and singing hymns, from which they gained hope and courage. In the early dawn the air became calm and still, and at sunrise the swans flew away from the rock with Eliza. The sea was still rough, and from their high position in the air, the white foam on the dark green waves looked like millions of swans swimming on the water. As the sun rose higher, Eliza saw before her, floating on the air, a range of mountains, with shining masses of ice on their summits. In the centre, rose a castle apparently a mile long, with rows of columns, rising one above another, while, around it, palm-trees waved and flowers bloomed as large as mill wheels. She asked if this was the land to which they were hastening. The swans shook their heads, for what she beheld were the beautiful ever-changing cloud palaces of the “Fata Morgana,” into which no mortal can enter. Eliza was still gazing at the scene, when mountains, forests, and castles melted away, and twenty stately churches rose in their stead, with high towers and pointed gothic windows. Eliza even fancied she could hear the tones of the organ, but it was the music of the murmuring sea which she heard. As they drew nearer to the churches, they also changed into a fleet of ships, which seemed to be sailing beneath her; but as she looked again, she found it was only a sea mist gliding over the ocean. So there continued to pass before her eyes a constant change of scene, till at last she saw the real land to which they were bound, with its blue mountains, its cedar forests, and its cities and palaces. Long before the sun went down, she sat on a rock, in front of a large cave, on the floor of which the over-grown yet delicate green creeping plants looked like an embroidered carpet. “Now we shall expect to hear what you dream of to-night,” said the youngest brother, as he showed his sister her bedroom. “Heaven grant that I may dream how to save you,” she replied. And this thought took such hold upon her mind that she prayed earnestly to God for help, and even in her sleep she continued to pray. Then it appeared to her as if she were flying high in the air, towards the cloudy palace of the “Fata Morgana,” and a fairy came out to meet her, radiant and beautiful in appearance, and yet very much like the old woman who had given her berries in the wood, and who had told her of the swans with golden crowns on their heads. “Your brothers can be released,” said she, “if you have only courage and perseverance. True, water is softer than your own delicate hands, and yet it polishes stones into shapes; it feels no pain as your fingers would feel, it has no soul, and cannot suffer such agony and torment as you will have to endure. Do you see the stinging nettle which I hold in my hand? Quantities of the same sort grow round the cave in which you sleep, but none will be of any use to you unless they grow upon the graves in a churchyard. These you must gather even while they burn blisters on your hands. Break them to pieces with your hands and feet, and they will become flax, from which you must spin and weave eleven coats with long sleeves; if these are then thrown over the eleven swans, the spell will be broken. But remember, that from the moment you commence your task until it is finished, even should it occupy years of your life, you must not speak. The first word you utter will pierce through the hearts of your brothers like a deadly dagger. Their lives hang upon your tongue. Remember all I have told you.” And as she finished speaking, she touched her hand lightly with the nettle, and a pain, as of burning fire, awoke Eliza. It was broad daylight, and close by where she had been sleeping lay a nettle like the one she had seen in her dream. She fell on her knees and offered her thanks to God. Then she went forth from the cave to begin her work with her delicate hands. She groped in amongst the ugly nettles, which burnt great blisters on her hands and arms, but she determined to bear it gladly if she could only release her dear brothers. So she bruised the nettles with her bare feet and spun the flax. At sunset her brothers returned and were very much frightened when they found her dumb. They believed it to be some new sorcery of their wicked step-mother. But when they saw her hands they understood what she was doing on their behalf, and the youngest brother wept, and where his tears fell the pain ceased, and the burning blisters vanished. She kept to her work all night, for she could not rest till she had released her dear brothers. During the whole of the following day, while her brothers were absent, she sat in solitude, but never before had the time flown so quickly. One coat was already finished and she had begun the second, when she heard the huntsman’s horn, and was struck with fear. The sound came nearer and nearer, she heard the dogs barking, and fled with terror into the cave. She hastily bound together the nettles she had gathered into a bundle and sat upon them. Immediately a great dog came bounding towards her out of the ravine, and then another and another; they barked loudly, ran back, and then came again. In a very few minutes all the huntsmen stood before the cave, and the handsomest of them was the king of the country. He advanced towards her, for he had never seen a more beautiful maiden. “How did you come here, my sweet child?” he asked. But Eliza shook her head. She dared not speak, at the cost of her brothers’ lives. And she hid her hands under her apron, so that the king might not see how she must be suffering. “Come with me,” he said; “here you cannot remain. If you are as good as you are beautiful, I will dress you in silk and velvet, I will place a golden crown upon your head, and you shall dwell, and rule, and make your home in my richest castle.” And then he lifted her on his horse. She wept and wrung her hands, but the king said, “I wish only for your happiness. A time will come when you will thank me for this.” And then he galloped away over the mountains, holding her before him on this horse, and the hunters followed behind them. As the sun went down, they approached a fair royal city, with churches, and cupolas. On arriving at the castle the king led her into marble halls, where large fountains played, and where the walls and the ceilings were covered with rich paintings. But she had no eyes for all these glorious sights, she could only mourn and weep. Patiently she allowed the women to array her in royal robes, to weave pearls in her hair, and draw soft gloves over her blistered fingers. As she stood before them in all her rich dress, she looked so dazzlingly beautiful that the court bowed low in her presence. Then the king declared his intention of making her his bride, but the archbishop shook his head, and whispered that the fair young maiden was only a witch who had blinded the king’s eyes and bewitched his heart. But the king would not listen to this; he ordered the music to sound, the daintiest dishes to be served, and the loveliest maidens to dance. After-wards he led her through fragrant gardens and lofty halls, but not a smile appeared on her lips or sparkled in her eyes. She looked the very picture of grief. Then the king opened the door of a little chamber in which she was to sleep; it was adorned with rich green tapestry, and resembled the cave in which he had found her. On the floor lay the bundle of flax which she had spun from the nettles, and under the ceiling hung the coat she had made. These things had been brought away from the cave as curiosities by one of the huntsmen.